History of 5th/4th Century Arts and Crafts of the Ancient Celts. Example of Late Hallstatt metalwork. A feature of the fifth century BCE was the number of contacts between the Mediterranean world, more especially northern Italy, and the Celtic peoples who lived in an area north of the Alps, which stretched from the Atlantic to the western edge of the Carpathian Basin. One of the consequences of these contacts was the emergence of a new form of artistic expression, very different from the geometrical art known until then in these regions and which distinguished itself not only by its repertory of ornamental motifs but also by the development of wholly original formal procedures. Celtic art in the fifth century BCE borrowed a number of elements from the Etruscan repertory - a plant world consisting of palmettes and lotus flowers, peopled by human figures with animal attributes (Silenus masks with pointed ears) and monsters such as griffins, sphinxes and chimeras. Celtic craftsmen plundered Etruscan art for its oriental elements, which in the fifth century BCE were confined almost exclusively to a decorative function. Not only did the Celts adopt other motifs, likewise of remote oriental ancestry, from the art of the Italic peoples which was more strongly imbued with this mythological repertory, but also they perhaps borrowed directly from the East itself. For instance, very ancient themes such as the "Tree of Life" guarded by monsters or birds, or the Lord of the Beasts, appear in the art of the Celts. This imagery, probably appropriated by them because it could be adapted fairly easily to their own religious universe - of which, unfortunately, little is known - was to remain with them, either transformed beyond recognition or in a form scarcely differing from the models, for almost 500 years on the Continent, and for far longer in the British Isles. Another novelty of Celtic art in the fifth century BCE was the use of the compass, either to engrave a pattern directly or to prepare a working drawing for elaborate and refined compositions. The predilection, engendered by the compass, for the geometrical interplay of curvilinear forms and volumes, remained from then on one of the basic features of Celtic culture. The works that have come down to us are chiefly small metal objects, since monumental sculpture was rare and architecture, in wood, is known only through the traces left in the ground. These surviving items consist almost exclusively of objects which accompanied important persons when they were buried, e.g. personal ornaments made of precious metals or bronze, decorated weapons, harness-trappings, metal decorations from chariots used in battle or for ceremonial purposes, and vessels from drinking-services. Among the latter, the richly decorated wine-flagons are particularly interesting as they show clearly the originality of the Celtic products when compared with the Etruscan models from which they derive. Although few in number, the stone sculptures are of great importance for they can only be interpreted as belonging to a religious context. The association of human faces in stone sculpture with similar elements found on metal objects confirms the probability that they were deities, unfortunately unidentified, of the Celtic pantheon. The objects which mark the beginning of Celtic art appear in the second quarter of the fifth century BCE at the earliest, and over a period of fifty years or so the new form of visual expression attained remarkable maturity. By the last quarter of the century some of the processes on which the specific character is based are already discernible in the more original works of Celtic art and it is those processes which enabled it at all times to assimilate its various borrowings and confer on them the stamp of unity. Among the most significant of these processes is the transformation of natural shapes into abstract elements of definitive character and the juxtaposition - and in some cases the fusion in the same composition - of human, animal, plant and abstract forms. Two other features are remarkable, first the determination to avoid all narrative and dramatic representation, using only indirect and partial allusion and second, the affinity for ambiguity, which led Celtic artists to create works that could be "read" or interpreted in many ways. Here is a selected list of artifacts, functional and decorative artworks from the early stage of European Celtic art. This find-spot was located on the eastern limit of the zone in which Celtic art emerged. The composition of the belt-clasp is similar to that of the Weiskirchen piece, where a face in the centre is executed in relief and is flanked by a pair of griffins engraved on the plate. This grave find clearly illustrates the ways in which the Celts transformed themes of remote oriental derivation. The central palmette, symbol of the Tree of Life, is replaced by a human face crowned by a pair of opposed S-motifs, a very frequent attribute enabling the observer to identify the deity. On each side of the central motif is a pair of winged sphinxes. The whole piece is enhanced by inset areas of coral, a substance valued for its magical properties. A central face, with animal ears and a "tiara" surmounted by a palmette, forms the end of the fibula, the part above the spring is lost. A pair of griffins decorate the openwork plate which concealed the spring. An expressive head without noticeable animal features constitutes the other end of the fibula. This object illustrates remarkably well the tendency of Celtic art to reduce natural forms into well-defined geometrical shape almost always with curvilinear contours. Grave find. The object is in embossed, openwork form and probably was used for decorating a drinking horn from the wine service deposited in the burial. The Mediterranean origin of the motif on the central strip-a row of palmettes alternating with lotus flowers-is easily recognized. However, the parts are arranged in such a manner that the lotus flowers may be interpreted in two ways-either as such, or as pairs of leaves framing the trifoliate palmette. Found in a grave, this mount probably decorated a wooden bowl. More elaborate than the combination of lotus flowers and palmettes encountered in the previous item, here the artist has recomposed the motifs, making as much use of the field as of the pattern. In the lower part of the principal strip, full trifoliate palmettes alternate with openwork lotus flowers. The motif has been divided up an transformed in such a way as to reduce it to a limited number of elements, the main one being a kind of dissymmetrical leaf (or in some cases in a half-palmette) terminating in a spiral scroll. Found in a chariot burial, the object, a phalera, was probably a harness decoration. One of the innovations of Celtic art in the fifth century BCE was the use of the compass, often very skilfully employed, and this bronze disc is one of the finest specimens of compass work in Celtic art of the period. The patterns are based on a working drawing prepared with a compass. The result is not, however, an abstract construction of curves and counter-curves, for the compass is used in such a way as to bring out specific forms - in this case, the lotus flowers - to which symbolic value was attached. The motif of the encircled palmette, symbol of the Tree of Life, here is transformed into a form evocative of a fan, which was to be used throughout the whole of Celtic art. This simple decoration was constructed with the help of a compass and the marks left by its point are still visible. The motif was then engraved by hand, which is why it is irregular and conceals the working drawing on which it was based. A grave find, this wine flagon with a handle in feline form of Celtic manufacture but derived from Etruscan models is distinctly original. Only Celtic artists associated animals with foliage motifs and with abstract motifs in this way, probably for symbolic reasons. Here the palmette is displayed on the animal's hind-quarters and spiral scrolls occur on the haunches and hindleg joints while S-motifs decorate the shoulders and frame the open jaws. Even the animal's coat is stylized with an unusual chequered pattern. This is the most important of the Celtic works in stone which can be assigned to the fifth century BCE. Surrounded by S-motifs, a stylized human head in the centre of each side is decorated with two foliage motifs - the trifoliate palmette under the chin and on the forehead, and a large pair of mistletoe leaves which form a type of headdress. The latter was a peculiarly Celtic motif, which undoubtedly possessed considerable symbolic significance and was probably the attribute of a much venerated deity. Originally, this grave find was inset with amber or coral studs. Once again the human face motif is encoutered, in association with the trifoliate palmette is arranged as a sort of headgear framing the face, while a pair of mistletoe leaves frame the top of the head. That the foliage motifs play the role of attributes in fifth centry BCE Celtic art is very apparent here. 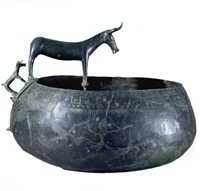 This bronze wine flagon, found in the grave of a woman of high rank, is undoubtedly one of the earliest examples of this type of utensil entirely designed and executed by the Celts. The series of motifs was either borrowed from the Etruscan repertory and adapted, or newly created. The most striking of these motifs invented by the Celts is unquestionably the human-headed horse which appears on the lid of the vessel and is represented again on Gaulish coins in the first century BCE. The horse's head is crowned with a pair of mistletoe leaves. The repousse decoration on these phalerae consists of a repetitive series of human faces, each of which is framed by a headdress formed of a pair of mistletoe leaves organized in two concentric zones. The faces were probably divine and therefore endowed with magical virtues. The figure on this object probably represents some deity or legendary hero rather than an ordinary individual. The clothes are similar to those seen on the Hallstatt scabbard. Discovered accidentally in 1962, these objects constitute an exceptional hoard illustrating the high quality of Celtic workmanship in gold. Although the rich decoration may be paralleled by that found on many contemporary objects discovered in the Rhineland or in central Europe, none equals it in exuberance. This is an exceptional work, not only because of its high quality, but also because of the importance assumed by the human element. The artist who designed and executed it undoubtedly was strongly influenced by the orientalizing art of the "situla" art of northern Italy and the eastern Alpine territories and probably, the only novelty in the decoration of the scabbard is that the human figures represent scenes from the (unfortunately unknown) mythology of the early Celts. This fibula is entirely decorated with a type of dissymmetrical leaf with a narrow tip forming a scroll. The symbolic significance of the motif is emphasized by its repetition at either end of the fibula in three different abstract compositions, which may also represent griffins' heads. The object illustrates with remarkable virtuosity one of the fundamental principles underlying the Celts' transformation of Mediterranean prototypes - the reconstitution of the image in terms of signs which were filled with meaning. Found in a chariot grave, this flagon is a good example of the perfect assimilation of elements chosen from the Mediterranean repertory and used in the expression of Celtic mythological concepts. On the handle attachment, a human head surrounded by a trifoliate palmette and S-motifs is crowned with "leaves" (similar to the decoration of the Ostheim fibula). Additional elements include strange monsters with long muzzles ending in scrolls (on the rim) and a grotesque animal leaning its chin on a human head with open eyes (on top of the handle). These bronze flagons are decorated with red champlevé enamel and coral insets. Practically all the iconography developed by the Celts before the fifth century BCE is represented here. For example, the palmette either is engraved and studded with coral (under the spout) or is emphasized by enamel insets and is associated with animals (on the handle) or is combined with the human face (on the handle base). Other motifs include a duck in high relief (on the spout), interlaced S-motifs (at the bottom of the vessel) and chequer-work (under the beak).  For more about the history of Irish culture, see: Ireland Visual Arts.  For information about the pre-Christian cultural history of Ireland, see: Irish Art Guide.  For more on the history of Celtic Hallstatt culture, see: Homepage.